Teachers love to tell students to use the active voice because it tends to make sentences shorter, clearer, and more impactful. But is it really a crime to write in the passive voice? Absolutely not. 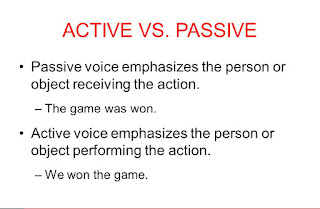 In many cases, the passive voice is actually preferable to the active voice. However, it does present many dangers that could make our writing wordy or unclear. 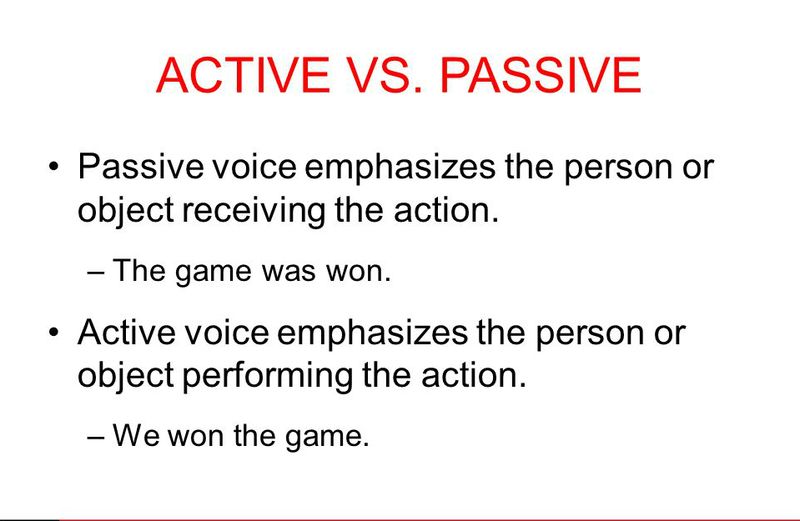 Let’s define the active and passive voices, then discuss some potential problems with passive writing. Kareem Abdul-Jabbar scored 38,387 points in his career. Kareem Abdul-Jabbar (subject) scored (verb) 38,387 points (object). In the passive voice, the subject is switched, so the object of the active sentence becomes the subject of the passive sentence. 38,387 points were scored by Kareem Abdul-Jabbar in his career. Unlike the subject in the active voice, the subject in the passive voice does nothing. In other words, the subject, points, takes no action. Instead, the points are acted upon. My parents bought groceries for my sister’s birthday party. The subject of the sentence, the parents, performs the action of buying groceries. The parents are the focus of the sentence. However, in the passive voice, the subject is switched, so the object of the active sentence becomes the subject in the passive. Groceries were bought by my parents for my sister’s birthday party. The subject, or focus, of the sentence takes no action. Instead, the groceries are acted upon by the parents. A passive voice can create confusion; it often disrupts rhythm and makes a sentence harder to understand. In many cases, verbs and subjects become vague or ambiguous. Evidence was presented to support the idea that homelessness is experienced by more than 600,000 people. A couple questions: Who is presenting this evidence? And how is the number of homeless people an idea? Also, because the subject, the evidence, doesn’t perform any action, the sentence is inherently confusing. The U.S. Census Bureau estimated the number of homeless people at 600,000. A talk was given by the college professor; she cited a paper that said homelessness went down last year. Again, the subject of the sentence, the “talk,” doesn’t do anything. Here, the passive voice creates a clunky break that requires a semicolon to keep the sentence grammatically correct. The subject of the first part of the sentence is the “talk,” but the talk doesn’t cite the paper, the professor does. See how confusing the subject can become in a passive sentence? The college professor cited a paper stating homelessness decreased last year. By changing the subject of the sentence to the doer of the action (the college professor), we get a simple, easy to read statement. When the car was driven by the racer, he sped out of control and hit the guardrail. When the agent is more important than the subject. Take the example: “My car was hit.” We want to focus on the car itself, since we care more about the car being damaged than we do about who damaged the car. When we want variety in our writing. Any kind of writing, no matter how active, tends to grow dull after awhile. Sentence rhythm and structure will feel stilted and repetitive, especially when each sentence is focused only on the drivers of action. In addition to grammar correction, PaperRater also performs a “Passive Voice” analysis that automatically scans your document for passive sentence constructions. Have you tried the FREE PaperRater automated proofreader? What are you waiting for? The yearly subscription is a great way to help you write a book! Thank you. I use to use your free services. And now I have got your blog to read useful tips. Your service is far superior than Grammarly and your fee structure is customer friendly. this is a GREAT tool! I never submit a college paper before using paperrater, I love how it checks so many different things. I am about to start University, and for the past two years I have had to review so much work before presenting, and at times is longer the process of writing a paper. This is going to be a valuable tool over the next four years. I have also used the Paperrater and I like it because it incorporates so many tools in one account. Thank you paperrater team! Thanks so much for the encouragement! Feel free to contact us with any additional feedback. Writing an ebook and not being a native English-speaker, I believe your tool (which I discovered only a few days ago) is really GREAT. It is certainly a major Plus to avoid any unnecessary criticism when the book will be published. Hope to be able soon to go for your Premium version. Paperrater, Fantastic tool! I am currently compiling an executive resume, after reading and rereading the words start to blend together. Therefore, it is essential to proof my work with Paperrater!!! Wow!The way they analyze different aspects of content is incredible. I am facing writing problem "I am unable to start the sentence well" Can anyone help me out solve this problem in writing. really helpful..it gave the same grade as my teacher. That's great. I love it when that happens! OMG. I did not know that. I use a lot of passive voices and my professor denied my paper to the best journal. Thank you!